Here I would like a more particular situation with Oanda open orders. Here we are in a process of accumulation of orders. But for the moment a gib accumulation of retail orders is missing. That means market makers would not be tempted to generate a spike into the orders level. And the second thing is that there is not a possibility of a trend continuation beased on stop losses domino movement. It looks like the market is cleared from all accumulation. This began to happen since the last week. Here I can add a range bound market state with the Oanda open orders levels. You can look that the orders are revealing the potential attraction zones for the future. Those levels cannot be seen in the chart alone. Those are hidden levels they are a part if the market but not in the chart. 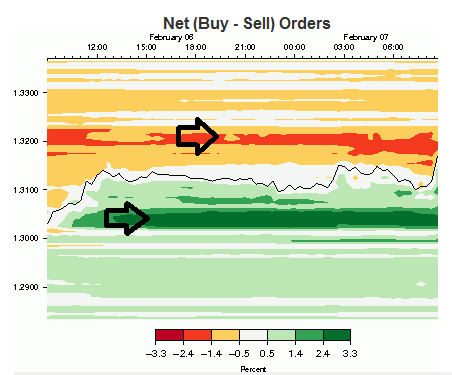 In those occasions it is possible to have some very complex market development activation both the buy and the sell orders in a very complex way. If you look at the chart we see a kind of transition between stable and quiet and stable and volatile.